For Kitchens where time is of the essence and convenience is a must, why not go hands-free? GROHE’s new FootControl taps can be turned on and off with a gentle tap of your foot on the base unit, leaving your hands free and your tap spotless at all times. 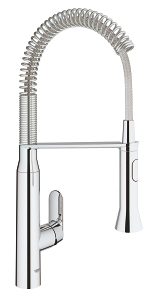 Three of our most popular taps now come with this innovative FootControl technology, or you can retro-fit the feature to any GROHE pull-out kitchen tap. To say goodbye to germs, mess and hassle, simply tap your feet! 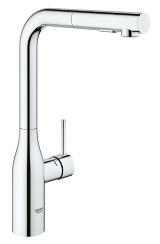 Unlock the professional potential of your kitchen with the K7 FootControl tap. Enjoy the high-performace of the K7’s professional spray feature and extractable hose combined with the convenience of foot activation technology. 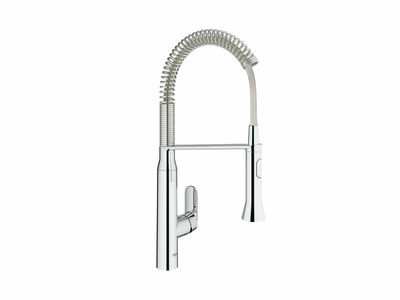 The tap’s crisp architectural styling makes it a design feature in itself, but the exceptional pro-level features mean its more than a match for any task. For busy kitchens where efficiency is a must the K7 FootControl tap puts you in total control – and leaves your hands free for other tasks. 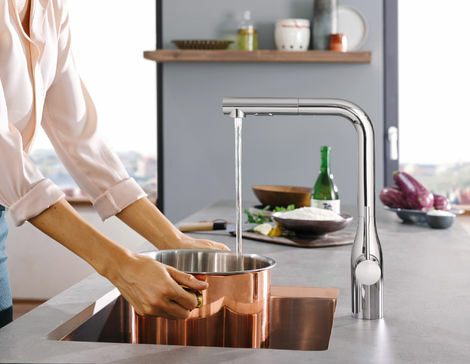 Introduce the purity of minimalism to your kitchen while enjoying the effortless functionality of hands-free operation with GROHE’s Essence FootControl tap. 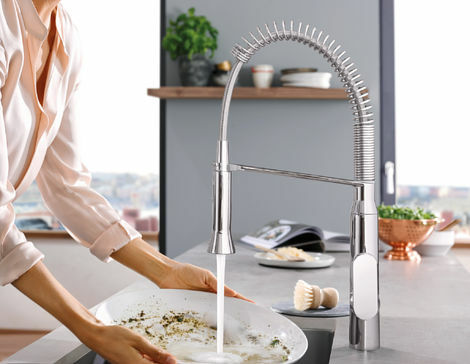 The sleek, simple lines of our Essence tap are the perfect complement to a contemporary kitchen, while the one-touch FootControl lets you keep your hands free and your tap germ-free.